Airtherm are pleased to announce the appointment of David Brown, who joins our vibrant and enthusiastic team of individuals, in the capacity of Associate Director. 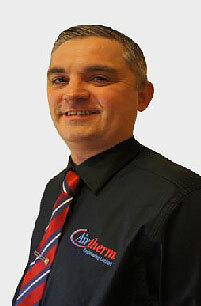 David has 22 years of sales experience in commercial and industrial heating & ventilation. He has worked for some large, well-known corporate companies, as well as a close competitor for 9 years, where he previously held the role as Renewables Manager and specialised in Natural Ventilation, Ventilation Controls and Natural Lighting Systems. He also has an extensive knowledge of Chimney & Flue and Commercial Kitchen Canopy systems. David also has a wealth of experience in the field of Health & Safety which brings an added value to our business. David will be a welcome addition to the company. Airtherm have also appointed Technical Sales Engineers covering the North West, East Midlands, West Midlands, North Wales, London & Scotland. If you have any enquiries in these locations, please call our office on 0844 809 2509 or email sales@airtherm.co.uk to arrange a meeting.